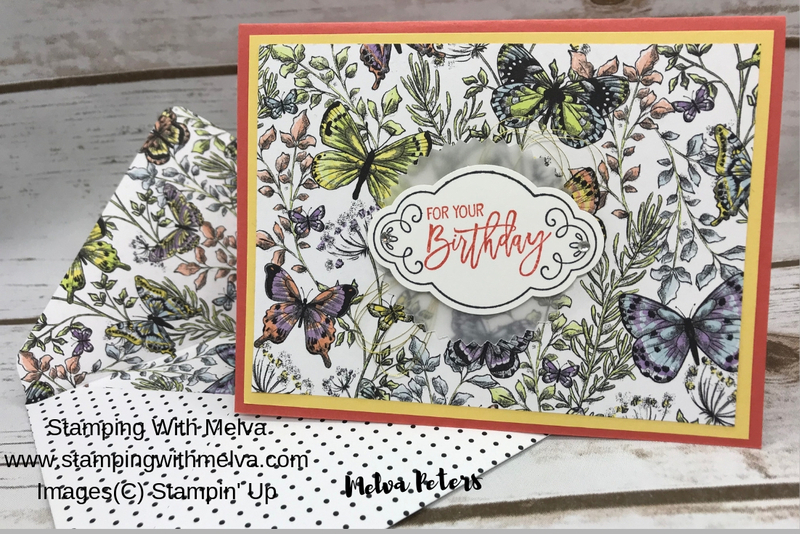 Stamp with Melva: Never Send a Naked Envelope! Today I'm sharing one of the cards that we'll be making in my "Never Send a Naked Envelope!" class on Saturday. I was inspired by Shelley Gardner at OnStage in Orlando when she said this! 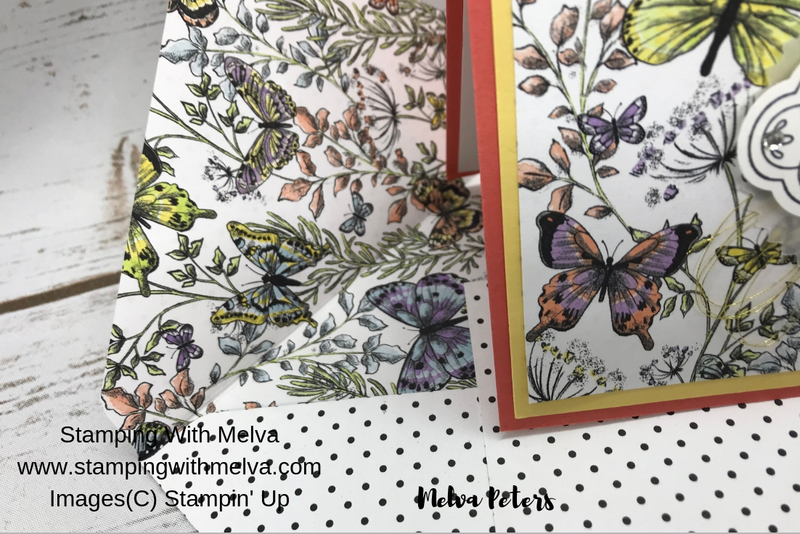 You can fancy up your envelopes by stamping on them, adding an insert or by making a coordinating envelope using Designer Series Paper with the Envelope Punch Board. Check out this beautiful card! My card features the Botanical Butterfly Designer Series Paper that is only available during Sale-a-Bration until March 31st. That's coming soon, so if you haven't got your package yet, make sure you order soon! The Designer Series Paper is the star of this card. 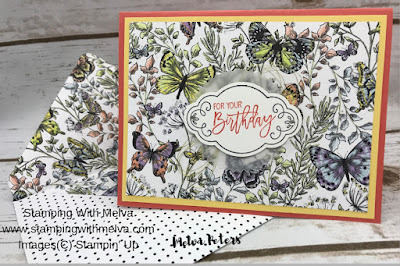 I used the Label Me Pretty stamp set and coordinating Pretty Label Punch along with the Birthday Cheers stamp set for the sentiment. It's hard to see in the picture, but there is vellum and Gold Metallic Thread behind the sentiment to add some bling. Fold Calypso Coral cardstock (5 1/2" x 8 1/2") in half to form card base. Stamp label outline using Tuxedo Black Memento Ink on a scrap of Whisper White cardstock. Punch out circle from Vellum cardstock using Starburst Punch and adhere over Metallic Thread using Snail. To make the envelope, cut a piece of Designer Series Paper 8" x 8" (follow the instructions on the punch board for the correct size of the card you are making). Line up the edge of the Designer Series Paper on the punch board as directed for the size of the card. I lined up at 3 1/2". Then punch and score. Turn your paper 90 degrees and line up the score line with the marked score line on the punch board. Punch and score. Repeat so that all sides of the Designer Series Paper are punched and scored. Round the top flap using the corner rounder on the Punch Board. Please be sure to use the current Host Code X4JSGHWW to receive a free gift from me. When you place a $50 order (before shipping and taxes) using the Host Code, I'll send you four cards and instructions by mail as a thank you. 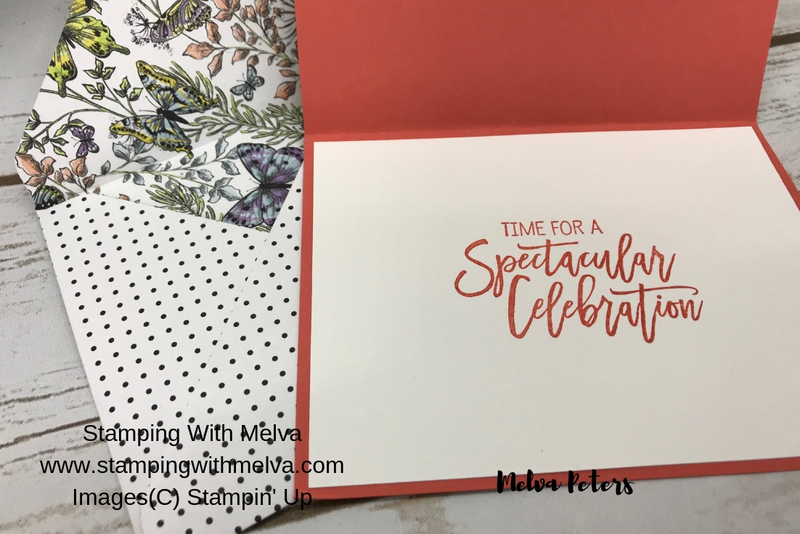 If your order is over $200, please do not use the Hostess Code as you'll qualify for Stampin' Rewards, but I'll still send you the 4 free cards!